Uwe & Colleen love dance, love to teach dance, and are very excited to bring their favorite moves and material to Seattle! Expect fun and high energy classes that will help you dance with flow and ease, lead with clarity and follow with grace and pleasure. You will learn beautiful and dynamic moves, from small to big, ready for the social and sometimes crowded dance floor (see video below). Colleen and Uwe will address partner connection and pleasant styling. Uwe's simple and short Physics of Dance demonstrations will show you helpful concepts for your waltz, foxtrot, swing, salsa, and more! Colleen will give you simple tools that will make your following and styling flow. There is plenty of parking available just outside the door. Come early to sign in, change shoes, stretch, warm up, etc. A) 10:00am-12:00pm WALTZ A: "FUNdamentals -- Easy Flow"
Bring your lunch, or order lunch with us at China Harbor. Relax & refuel! 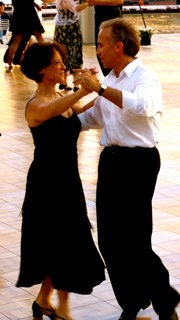 B) 1:00 - 3:00pm WALTZ B: "Instructor's Favorite Moves & Combos"
C) 3:15 - 5:15pm: Foxtrot into Swing: "Glide with Comfort & Natural Ease at all Speeds"
Learn this universal, fun & foxy dance, and how to blend it into your swing. Learn Foxtrot variation to adjust to speed, plus dance to great music! Many of you know us and know that we LOVE Waltz. We teach it at 4 levels, pretty much throughout the year, and still can't get enough of it, and keep developing new skills and types of moves. We've got plenty to share and want to give you the BEST. More focus on making fun moves flow on the social dance floor, since we want you to own it and bring it alive on the floor. We will focus on Foxtrot with SSQQ, SQQ, SSS and QQQ rhythms. This covers the whole range, and gets you dancing with comfort and smoothness for any flavor of music and speeds from 70 to above 200 bpm. No more rushing or crawling through faster or slower songs, respectively. The keys are the transitions and how to lead and follow them. This is not easy, but can be done, and serves as a great tool for enhancing follow and lead skills for any dance. We will guide you through this. We have great classes with this, and dancers are using it on the PDX floors. You will move along and might even sing along. Lots of smiles guaranteed. You should be comfortable with Single Time Swing! We will address Single, Double, and Triple Time Swing, with some useful tips to efficiently move within these Swing dances, as well as how to merge them with your new Foxtrot skills. This gives you a chance on the social dance floor to safely add small portions of Foxtrot into your Swing, until your and your partner's comfort level naturally increases to dance Foxtrot for an entire song. Pre-registration is highly encouraged to maintain lead/follow balance. You can pay online by Visa or PayPal, or by cash or check at the door. Uwe & Colleen here. We are VERY EXCITED to return to Seattle for our once a year workshop with you! It has been a wonderful year of teaching in Portland, with great classes and happy students. We have hit sweet spots with our approach to Swing and Foxtrot, as well as Salsa, and our Waltz classes help more and more students to increase the quality in their dancing. We see lots of smiles and nice dancing in all classes.